More on these routers below. The links above will take you through to look at customer reviews and prices on Amazon. Ok, so what are the best AC2400 routers for 2017? Well, there’s not a whole lot of choice , so perhaps this won’t take too long to answer! Basically, there are only two AC2400 routers available at time of writing. Well, one is the Asus RT-AC87U. The other is the Linksys E8350. It’s within the upper-end of the scale when it comes to price. That’s to be expected, given the specifications. What Do The Best AC2400 Routers Have In Common? So what do these two bad boys have in common? Multi User – Multiple In Multiple Out, to give its full term, introduces MIMO to multiple clients at the same time. Traditional MIMO, which has been around since the days on Wireless N, can only give its benefits to one client at any one time. Although MU-MIMO client radios aren’t available just yet, they will be very soon. Both the E8350 and the RT-AC87U have dual core processors. The E8350 has a 1.4GHz processor, while the Asus equivalent has just a 1GHz dual core, but also has a 2nd dual core, which is designed purely to look after 5GHz Wi-Fi tasks. Each router has a USB 3.0 port and a second USB 2.0 port. Where the E8350 comes into its own is the USB 2.0 port that doubles up as an eSATA port as well – very useful indeed! There are four antennas that can be fully adjusted to fit in with your surroundings. Or if you really want, replace them with antennas of your choice. Four spatial streams are exclusive to the .11ac world. With more spatial streams comes more refined traffic flows, increasing Wi-Fi speeds considerably. There are no 4×4 wireless clients available just yet. 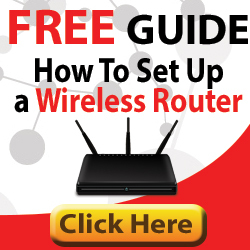 However, you can bridge with another 4×4 router and potentially hit real speeds over 1Gbps! Not bad, eh? Wi-Fi coverage increases. Reliability improves. Speeds rise. These are the advantages of beamforming. There’s no point sending signals out in all directions, all the time…it’s a bit of a waste. Beamforming sends directional signal to the client, only as and when it needs it. Make sure your fragile Internet traffic is given some protection with Quality of Service. Both routers have 1Gbps ports – 4x LAN & 1 WAN. With the Asus however, there is the option to ‘borrow’ one of the LAN ports. Useful if you have a backup modem, and you want to connect to that in the event of an ISP failure on your primary Internet connection. You can also bundle 2 LAN ports for resilience or to double speed to a particular wired Ethernet device – a server or NAS box perhaps? Just Exactly What Does AC2400 Mean? AC2400 is a cumulative data rate spread over all Wi-Fi bands. In the case of these two routers, 1.8Gbps is dedicated for the AC, and 600Mbps for Wi-Fi ‘N’. It really is that simple. It’s more of an ‘easy to remember’ or ‘catchy’ marketing term for a router with a certain amount of cumulative data rate. The Asus router – designed to look like a stealth bomber. The Linksys is slightly cheaper than the Asus, but pretty much does the same job.